New York, NY (September 7, 2016) – New York-based specialty distributor Rialto Pictures announces the return to theaters of Gillo Pontecorvo’s 1966 masterpiece “The Battle of Algiers”, this year celebrating its 50 anniversary with a stunning new 4K restoration. The new “Battle of Algiers” restoration has the distinction of being selected for all three major international film festivals this fall: Venice, New York and Toronto. “Battle of Algiers” originally premiered at Venice in 1966 and was the opening night selection of the 4th New York Film Festival in 1967. Theatrical runs begin on October 7 at New York’s Film Forum, Landmark’s Nuart in Los Angeles and E Street Cinema in Washington, D.C., followed by a major city roll-out through the fall. Saadi Yacef, whose memoir Souvenirs de la Battaile D’Alger formed the basis for the film, is scheduled to appear at screenings in New York, Washington and Los Angeles. One of the leaders of Algeria’s National Liberation Front during the country’s war of independence, Mr. Yacef was also a producer of “Battle of Algiers” and plays a major role (a part based on himself). 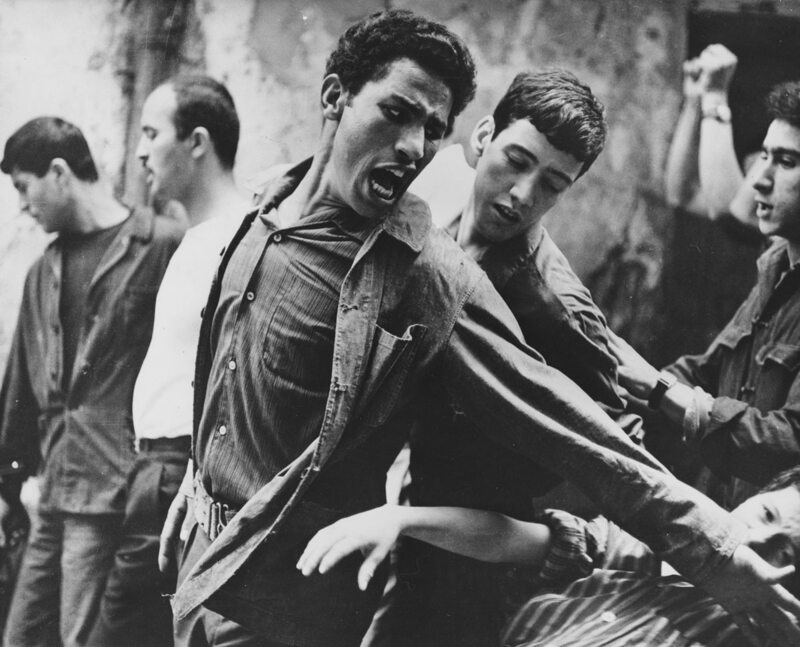 “The Battle of Algiers” depicts Algeria’s uprising against the French occupation in the 1950s. Pontecorvo and cinematographer Marcello Gatti broke new ground in creating a documentary look that convinced viewers they were watching actual events unfold, though not one foot of newsreel or stock footage was used. This heightened realism, combined with the use of unknown actors and Ennio Morricone’s unforgettable pulsing score, instantly created a universally acclaimed classic, which won the Venice Film Festival’s Golden Lion and was nominated for three Academy Awards: Best Foreign Film, Best Director, and Best Screenplay (by Pontecorvo and Franco Solinas). Arguably a “how to” in organizing and implementing a revolution, “Algiers” was banned in France on first release, then embraced by radical left groups like the Black Panthers, and ironically used in training of the notorious right wing death squads in Argentina. In 2003, shortly after the U.S. invasion of Iraq, it was screened by the Pentagon. The new 4K restoration was performed by Cineteca di Bologna and Istituto Luce – Cinecittà at L’Immagine Ritrovata laboratory, in collaboration with Surf Film, Casbah Entertainment, Inc. and CultFilms. At this year’s New York Film Festival, Rialto will also be unveiling a new restoration of Julien Duvivier’s long-unseen Film Noir masterpiece “Panique” (1946), starring Michel Simon and based on a novel by Georges Simenon.